The correct position for your wheels is specified by the vehicle manufacturer and during the manufacture process, or following work to your vehicle, your wheels will be set to this position. This process is called wheel alignment. Ensuring that your wheels point in the optimal direction will enhance vehicle handling, steering and reduce uneven tyre wear. It doesn’t have to take something major for your wheels to become misaligned, simple driving annoyances such as driving over a pothole or hitting a kerb can force your wheels to move and misalign. Your wheels can also become misaligned following work to the suspension or steering of your vehicle and when you have your tyres changed. It is recommended that you always have your wheel alignment checked following a tyre change. The toe measurement expresses which direction the wheels are pointing in, relative to the centre of the vehicle. If the toe measurement is incorrect it can cause poor handling and excessive, uneven tyre wear. This can be caused by incorrect adjustments or damage to the steering components. The camber angle is the vertical tilt of the wheels and it controls how much of the wheel is in contact with the surface of the road. When the wheel leans either in or out from the true vertical it can result in uneven tyre wear, poor handling and the vehicle may pull to either side when driving. The caster angle is created by steering pivots from front to back of the vehicle, it is responsible for keeping the vehicle stable. If the caster angle is misaligned it can result in difficulty controlling the vehicle. Suspect your wheels may have become misaligned? 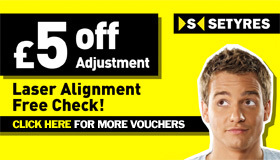 Book a FREE Wheel Alignment Check at your local Setyres branch and use our voucher to save £5 on any necessary adjustments you may require.